When reading the premise of Tanya Ronder's adaptation of Shahid Nadeem’s play, it is easy to doubt the relevance of this history play to a modern audience. However, in seeing this production, it became clear that the issues raised could hardly be more relevant to us today. 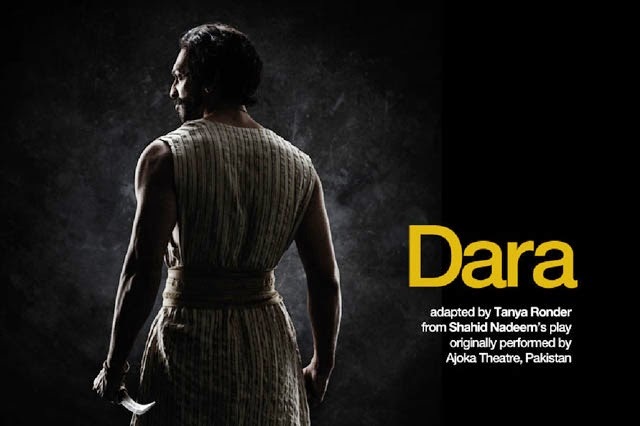 Set in India in 1659, the play chronicles the lives of brothers Dara and Aurangzeb as they fight for the throne. Dara is the crown prince, popular with the people, his Father's firm favourite, and a believer in religious tolerance, while his brother is a strict follower of the restrictive tenets of Islam, at the cost of everything else. The show is played out in different time frames with subtitles to direct the narrative. At first this is somewhat disjointed as we move between time frames and places, though it became less bothersome once the main characters had been introduced. As the story found its footing, the exposition allowed opportunity for the ideas to shine through, and it was a pleasure to watch. There is a richness to the characters' back stories which allows us to see the transformation of the protagonists. The show was not flawless; I saw it during the first week of previews and there were members of the supporting cast who it seemed still needed to warm into their roles as they delivered lines like lines from a script, rather than with the ease the primary members of the cast demonstrated. My theatre going partner was also less than keen at how often actors were playing to the audience, though this did not really bother me. That said, the strong performances from the leading men were utterly absorbing with Zubin Varla as Dara and Sargon Yelda as Aurangzeb. Varla in particular, raised the standard of the show when we reached the trial scene, during which time I had that almost transcendental experience one gets when encountering art that says something with real meaning. Varla is working with a great text, though his passion came through so strongly I momentarily forgot I was in a theatre and believed in this man of true faith who was able to see beyond his own beliefs, to appreciate the faith in others. If there is a more poignant message for our time, I'm not certain what it is, with events in Paris demonstrating how religious intolerance leads humanity down a dark path. The second half of Dara unfolds with the devastating inevitability of the best tragedies and we're left wondering at the corrupting influence of power, and the damaging effect of extremes of religion. This is a play for our time and one that many would benefit from seeing.